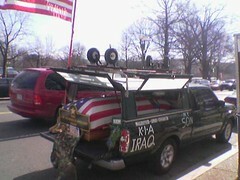 I saw this pickup truck drive by my building today, flag-draped coffin in the rear, with a large US flag flying above it. He pulled up by the Hall of States, either to get a hotdog from the sidewalk cart or get interviewed by C-Span or Fox. Turns out it’s Carlos Arredondo, the man who, distraught when informed by the Marines of his son Alexander’s death in Iraq, set himself on fire in the Marines’ van. Carlos survived, and is now an antiwar activist who reaches out to other families who have lost military children in the war. He spoke at the Saturday protest. Here’s more on the memorial truck. 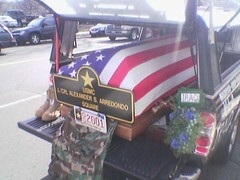 It’s not Alexander’s actual casket in the back, but it’s surrounded by artifacts from his tour of duty. The boots, for example.